Is that one of yours, Jodi? If so, that is awesome. 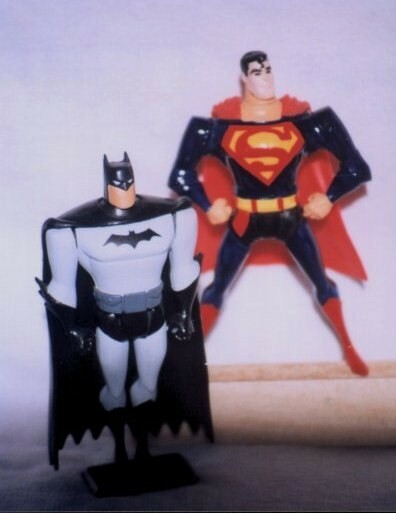 From the New Batman/Superman Adventures! I took two Batman figures and re-posed the limbs and painted. I'm guilty of using the Testors model paint. I hate that it makes a shine, and it does stay sticky to the touch but I'm a cheapskate! I admire you all that do it right with the proper tools, but I prefer to McGyver my stuff. I love that they made the figure with the jet pack, but the figure itself stood upright and I HAD TO change it. I used a long wire coat hanger to suspend it from a shelf and it looked great! I also did a Robin with jet pack, but no pics yet. I like how you used the diorama. I had my figures displayed with a poster-thingee from a sticker book. Red Claw, Clock King, Kyodai Ken, Commissioner Gordon, Grey Ghost, Talia, Grant Walker. Freakazoid season 1 on sale July 29th! The chi effect is from a Psylocke figure, and it's simply taped onto the wrist. Cheesy, but it looks okay high up on the shelf. No I found it on google to show what we could do with a blank My Pretty Pony, which are only 3.99 , so I ordered 2 and I'll post pictures when I get them done. The paint I use, only cost about 49 cents to 79 cents a bottle and it lasts forever. Once you have it, you will never want to use anything else, I didn't think it would be as good but it is amazing for being so cheap. 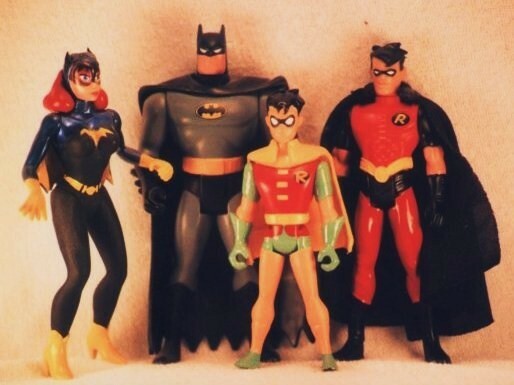 Lars I saw the Robin and fell in love with the whole line of action figures, I really like how you have them displayed. 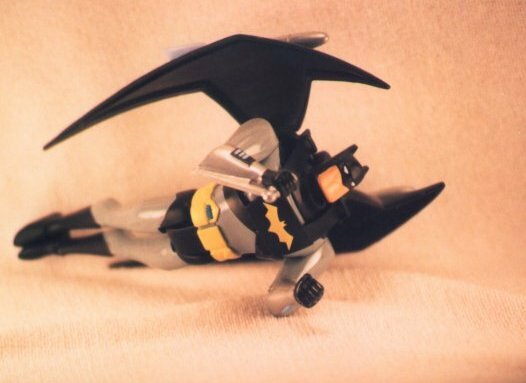 Your Batman re-pose and paint is excellent. Edited to add: Man Lars, those are so nice!!!! 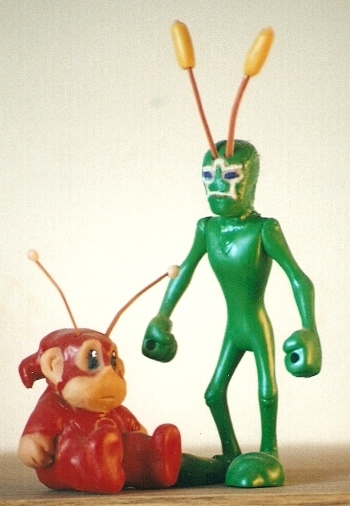 Ambush Bug The Animated Series! Made from a Wile E. Coyote fig, Cheeks the toy wonder is Sculpy. I'm another big fan of those paints. I've used the Citadel brand and another called Polly S since I gave up on Testors about 20 years ago, and never looked back. It's just in the last year or so, after clearing out a ton of dried up 'pots' and replacing them, that I decided to try out the Delta Creamcoat and Americana brands. Wow. Similar quality to Games Workshop, a much bigger selection of shades, and they cost less than a dollar for 2oz. Compare that to $3+ for one paint a fifth of the size and you're paying 1/15 the price. Gotta like that! This Batgirl is the first figure I ever customized. It's from Earthworm Jim, Princess Whatsername. 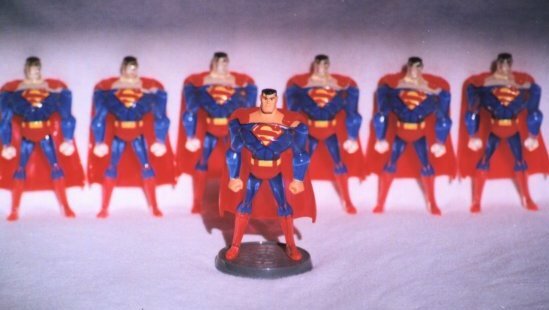 Justice League Superman toy from Subway. Painted some skin tone on him because for some reason he came transparent. 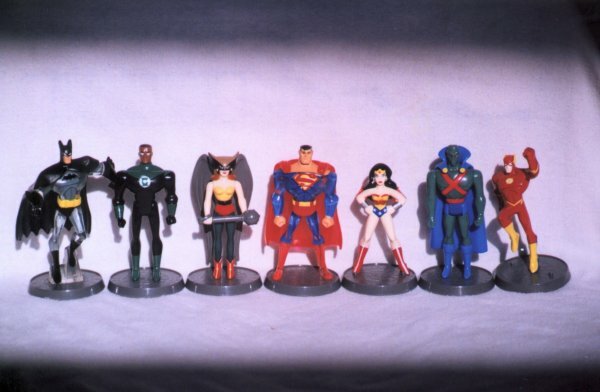 JB has these figures on his shelves as well from what I could see in some of the random photos that he has shared. 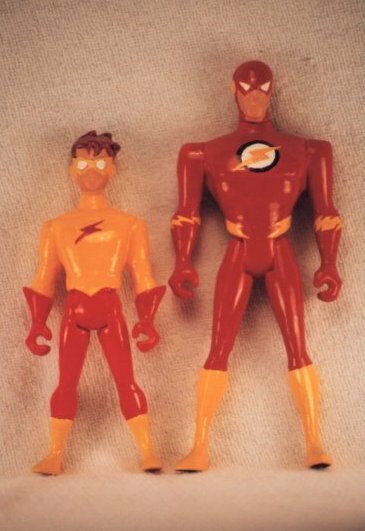 WW and Flash were connected to a straw that I happily dremmelled away. I've been customizing figures since, well, forever. Mostly I customize 3 3/4" figures, since a) I can do vehicles for the figures at that scale and b) it takes a lot of 'em to fill up space. As I posted on another thread, I give you...Airwolf. Looks like you've been busy, Lars. Great stuff. I did all of these between 5-10 years ago, the last time I worked on my figures was almost two years past. Amazing Airwolf btw. Lighted interior? Amazing. I understand about not working on figures for a while. Other than the occasional project, I just don't have the time to do as much as I'd like. Thanks for the compliment; Airwolf was a long time comin', and there were times I thought it would never get done. Truth be told, I still should do some detail work here and there, but I'm working on other stuff right now. seemed to be sticky, do you have the same problem? It dried fairly quickly, but I let it sit a little over an hour just in case. looks "right", but I wish I had taken the Sharpie advice instead. Wow!! Blown away by everything so far! I have a feeling I'm going to be saying "Wow" a whole lot in this thread. Steve really nice, the lighted interior is so cool. All my stuff is packed away and I will get it out as soon as my niece leaves. I did some Star Wars first for my son then I did some stuff for myself, like the Batman figures. I am going to hook up a scanner because so much of the stuff I have is on actual photos and not my computer. Something else that helped, I bought a super cheap toaster oven to use for cooking the sculpy instead of my regular oven. Has anyone on here used epoxy to make the clear stuff, used on figures? I had someone tell me it worked great but I have never used it. Enamels, like Testors, don't dry when applied to the softer, more flexible plastics a lot of today's figures are made of. Acrylics usually work much better, although they usually requirie more coats to get good coverage. I hear ya, Jodi. 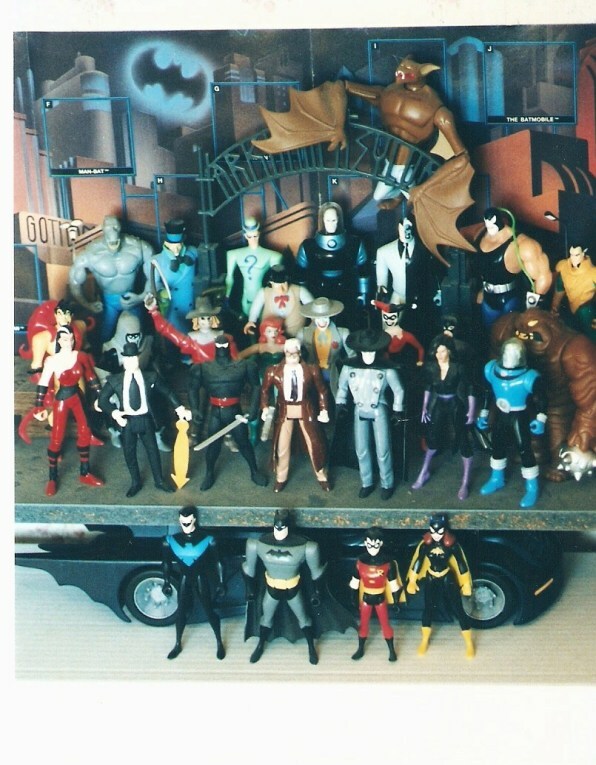 I took a lot of photos of my figures back in the day. They're all on film, and a pain to get on-line. What kind of epoxy are you talking about? There's a polyester resin material used to embed flowers and such that's clear. 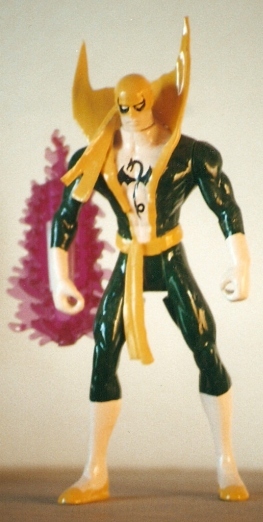 Used it a long time ago on an in-action figure. I used Super Sculpy in an oven once to disastrous effect, so I stick with a quick-drying clay. Very easy to smooth out the fingerprints.